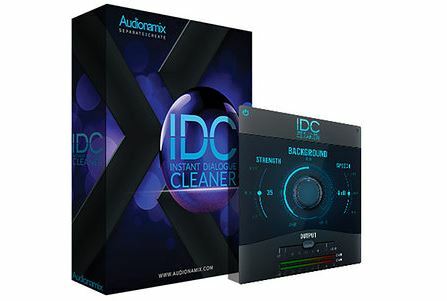 Audionamix Instant Dialogue Cleaner. Who knew that such a thing was even possible? Check out this amazing product if you are, like we are, working in the digital voice replacement business, then this will be a godsend if it works seamlessly. Specialists in audio source separation, Audionamix have carved out something of a niche with their range sophisticated plug-ins, capable of separating fully mixed audio into component parts for the purpose of restoration or remixing. Their latest effort is called IDC: Instant Dialogue Cleaner and it’s specifically designed to remove unwanted background noise from recorded dialogue. While traditional “de-noisers” work by listening to portions of background noise and removing everything that fits the same profile, this new plug-in is said to automatically detect and separate speech from surrounding noise, all on its own. Working locally (as opposed to relying on cloud-based processing) and in real-time, it uses deep neural network artificial intelligence techniques to identify dialogue. The plug-in then provides independent +/-24dB gain controls for the separated speech and background elements, plus a separation strength parameter designed to avoid artifacts. Audionamix are billing it as a one-knob solution for removing everything from wind and traffic noise to excessive room ambience. Supporting sample rates up 192kHz and bit depths up to 32-bit, Instant Dialogue Cleaner is available now priced at $199.